1.Export the SPM - Labels report with output type set to Excel. 2.Go to Avery Design & Print Online or download and install Avery Design and Print. 3.Enter an Avery product number and click GO. 4.Use the menu on the left to browse design categories. Or, select a blank template and upload your own design. 5.From the menu on the left, select import data, and navigate to the SPM - Labels report. Follow the prompts to arrange the data fields. Note: In Avery Design and Print Online, data imports are limited to 3,000 rows and 20 columns. The SPM - Labels report will need to be trimmed prior to importing. Columns are not limited in the desktop version of Avery Design and Print. 6.Projects may be be saved and opened later using the Open and Save buttons in the upper right corner. 1.To add a barcode, select More from the menu on the left, then click QR and Barcodes. Use the drop-down menu to choose the format and code type. When done, click the Merge button. 2.A pop-up window will appear. 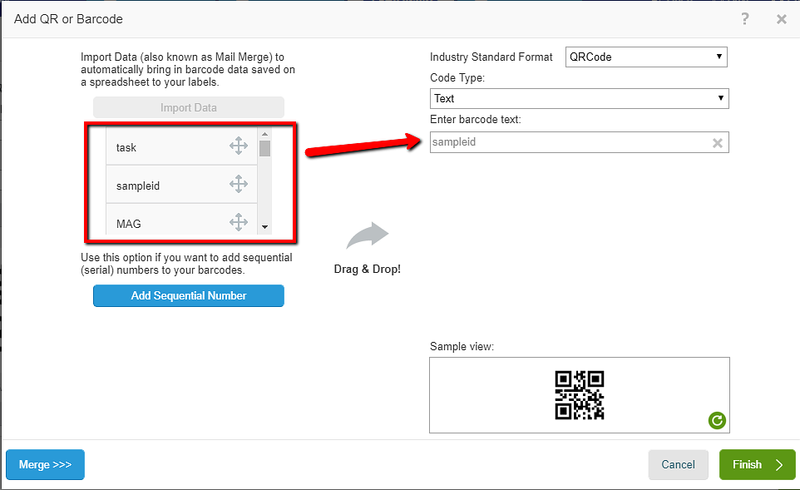 Choose to import the barcode data from a spreadsheet, add sequential numbering, or type in a specific barcode. The sample view will display the barcode. Click the circular arrow button to refresh the view image after entering the barcode information. Once complete, click Finish. 3.Use a barcode scanner or other device to test the barcode on the screen to ensure it works correctly. The example below has been configured with a QR Code that, when scanned, shows the Sample ID text. These steps are modified from Avery's How to Create Your Own Barcodes webpage. Avery Design and Print supports a wide variety of templates with respect to visual design. To view templates, please visit Avery Templates. 1.Export the SPM - Labels report with the output type set to dbf. 3.Import the SPM - Labels report, then follow the prompts to arrange the data fields. 1.Click the Master tab to select it, and then select Insert > Bar Code. 2.Select Database > Insert Field. Use "sampleid" to create bar codes from sys_sample_codes. 3.Right-click the object and select Format Bar Code. 4.Choose Code 128 (Type A,B,C) and check Display Plaintext to show the text under the bar code.